To download and archive entire cases or a set of documents (zip format) to your desktop, first select from the Dashboard page which account and case you will be archiving. You can only work on one case at a time. When you have selected an account and a case to see all the documents uploaded into the case, go to the Browse page> Fields>Show Fields located on the lower left side of the page and select which fields you want to view in the main document window (Original Title, Document Extension, Size, Type and etc.). >By default 'All' documents in the case will be selected if you click on 'Select Docs: All'. The main table from the Browse page only displays the first 25 documents per page, but the entire database is selected. If you want to download only 25 documents from the current case, click on the link "Page". The 'Export to Briefcase' button allows you save the current view on the Desktop in an zip file. 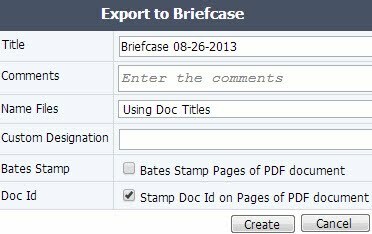 To complete this function, click on the 'Export to Briefcase' button. >Adding Bates numbering to a large number of documents can take a long time or even time out. If this happens, you can break into smaller batches and download again. (if a Bates number is already on the PDF image, then this function will write the Bates again which may not be intended). >You can either ‘Go To Download Briefcase Page’, 'Stay on Current Page' or 'Cancel Briefcase' action. If you choose to go to download page, the following screen will be displayed. After you click on 'Download' to download the Zip file to your desktop, choose 'Save' to save the Zip file on to your Desktop. It would take few minutes for the file to download depending upon the size of the file. Then click 'Open' to open the downloaded file. To learn to how to Unzip the File Using Windows, please click on the following link. >Windows users can create Download Briefcases of any size; however, larger downloads can take a long time to create. MAC OS X does not support very large Briefcases and we recommend that MAC users create multiple Download Briefcases of 2 GB in size. >Many computers and browsers have limits on the file size they can download (e.g., 4 GBs). >Downloading very large files requires a very fast internet connection. For example if you are downloading on a business internet connection (5 Mbps) and you have full use, the estimated time is 30 minutes per GB. On a slower T-1 connection (.7 Mbps) the estimated time is over 3 Hrs per GB).>We have tested very large downloads using Firefox Web Browser (64-bit) on Windows 7 (64 bit) with a NTFS file system or drive. >For all but the most sophisticated users, we recommend creating smaller downloads (e.g. 1-2 GBs) in size. >For large downloads we offer Technical services (separate charge) to transfer a Briefcase to a secure FTP account or ship on a Flash or USB Drive. >You should plan sufficient time to complete any downloads and meet deadlines, including your quality control procedures, the possible need to rerun productions or briefcases if changes are made, and possible delays in downloads/slower downloads than expected/need to restart downloads. the size of the original documents produced. Lexbe eDiscovery Platform charges include storage from Briefcases, as well as other storage used. When you click switch to the ‘Download Briefcase’ page, please be advised the progress for the entire upload based on your Internet Speed and size of Zip File. Our web interface supports downloads up to 10 GB at a time as a single zip download (enough to fill a single-sided standard DVD). Please note that even large downloads can take an extended period of time to ZIP and prepare, depending on the number of files and if Bates stamping is requested. Therefore you can leave the download page and check back later for completion. We recommend our users to break their document download up into small batches of 4.5 GB or smaller, and complete one at a time. You can save and export to an Excel Spreadsheet all the Metadata from your case (Notes, Case Participants, Facts & Issues and all the Production Log). In this example we'll show the steps on how to save and export Notes. Navigate to Analysis>Case Notes and select the Notes from 'Case Notes Title' and then click on the 'Export to Excel' button. >After a dialog box appears and gives you the option to 'open', 'save' or cancel the document. Choose 'Save' to save the file in Excel. >Then click 'Open' to open the downloaded file. >You can print notes after downloading to an excel spreadsheet. Follow the same steps to save and export Case Participants and Facts & Issues from the ‘Analysis’ page. For the production Log please open Discovery>Document Production page and after creating a Production, click on ‘Log (Excel)’. Once you have exported information and documents to Microsoft Excel and to your desktop, please click help page for further details. We have created a help page specific for Facts & Issues spreadsheets. This function is under the 'Case>Add Case Documents' page from the main menu. When exporting and re-importing documents the case folder structure is not retained. The folder structure can be retained with a downloaded spreadsheet for archival information (from Browse page>Export to Excel). Also, if there are not too many folders to be transferred, you could download folders one at a time and upload a folder at a time into a same-named folder in the new case. Or many at a time could be transferred this way with the zip upload option to retain folder structure. Import of TIFF files requires a special load file procedure that we handle as a paid eDiscovery service. Please contact your sales rep for more details. If you have a document collection that is too large to comfortably upload into Lexbe by yourself. Lexbe eDiscovery Platform offers service in which you can send us your files on a flash key or drive or CDs/DVDs. Simply place the files on a portable flash drive or CDs/DVDs and send to us at: Customer Service Lexbe.com, 8701 N. Mopac Expy, suite 320, Austin, TX 78759 or contact your sales representative to set up this service. We offer a service for firm plan clients to host data on a ‘hibernated basis’ (no client access) at a reduced monthly charge. All metadata and coding in retained and you can restore to full access in the future as needed by restoring to a full account and paying the current month on a full access basis. Please contact your sales representative for more information. If you wish us to download and send the data from your account, our technical support can download the contents of your Lexbe eDiscovery Platform account for you, copy to a flash drive and mail it to your office. The cost is $15 per GB, plus $10 per case, $150 minimum (free shipping using USPS - Priority Mail Express services). If you want to use this service please reply to this email prior to the effective date of your account termination (within 10 days after receiving the account cancellation request) including the case(s) name(s) to be downloaded.